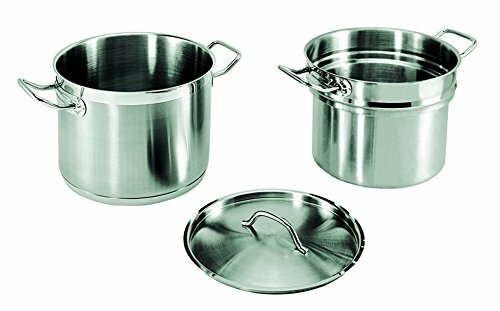 This induction ready double boiler with cover is constructed of stainless steel. These are essential in preparing some ingredients to be used in cooking. Features a natural finish. It is able to be used on an induction range. Comes with 20-quart capacity. Boiler measures 12-3/8-inch diameter by 11-3/4-inch depth. Insert measures 12-inch diameter by 10-3/4-inch depth.